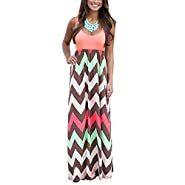 WEACZZY Women's plain flowy soft and comfy Loose long maxi dress with pockets,flowy dress, simple but fashion style dress two handy side pockets you'll love. Skip the maxi dress, and flatter your shape with this striking maxi. A flowy material with stretch keeps you comfortable all day long, while the pretty crochet trim accentuates your waist! We have registered the American brand "WEACZZY" and we are US sellers! A:Hand wash cold, line dry. 2)Q:What is this dress made out of? A:It's made for the Rayon and Spandex,it can be stretch. A:You can choose it according normal size,our size are US standard size . A:It is fit for any season,you can wear it in Spring,Summer,Fall,Winter,simple but fashion style dress. US SIZE:S(US 4-6),M(US 8-10),L(US 12-14),XL(US 16-18),2XL(US 20). Model is 5'5, size 2, 32D and is shown wearing a small. 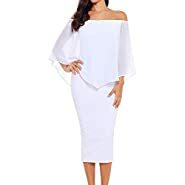 Features:Casual Style,Elegant,Sleeveless,Scoop Neck,Racerback,High Wastied,Long Floor Length,Solid Dress,Slim Fit,Long dress with pom pom trim and two side pockets. Fabric:Polyester + Spandex,Super soft,stretchy and lightweight,Classy high quality fabric,very soft to touch and wear. You can pair a belt and jacket with it,a different beautiful look will occur.Perfect dress for casual,pregnancy,wedding,party,vacation,streetwear,cocktail,daily life. Attention:Please recognize our brand name"WEACZZY",We can't guarantee the quality of other sellers provided can be same as ours.